Family Carers Ireland presented its Pre-Budget Submission 2018 to Government today in Dublin. The Submission is titled ‘Budget 2018: Share the Care’ to highlight that care must be a shared responsibility between the state, community and wider family – not left solely to family carers struggling with insufficient supports. One in twenty people in Ireland today is a family carer, collectively providing €10 billion in unpaid care each year. By 2030, demographic changes will require one in five to take on a caring role. Family carers are plugging the holes in an inadequate health system, often at a high personal cost financially, physically and emotionally. Speaking on the launch, Catherine Cox, Family Carers Ireland said, “Throughout our 22 resource centres across Ireland, it is clear that family carers are under-supported and find it very difficult to access vital services, such as respite care to give them a much-needed break. This is not something new but with home help hours cut significantly over the last number of years combined with an increase in the number of people requiring care, it is a seriously growing problem. Two family carers presented at the launch emphasising the challenges they face due to serious lack of supports and services on the ground. Dorothy Meaney, Ireland’s Carer of the Year 2017 from Limerick, cares for her daughter, Zondra (31), who has a tissue disorder adversely affecting every part of the body called Ehlers-Danlos syndrome, and is a wheel-chair user. One of Dorothy’s main pressures is that she and Zondra have to travel to the UK for treatment every 12 weeks at their own expense as this treatment is not available in Ireland. Eamon O’ Fearghail, aged 47 from Dublin, cares full time since 2010 for his widowed mother Cathleen, aged 87, who has Alzheimer’s Disease. He wants to respect her wishes not to go into a nursing home, but finds his role difficult. At one point, he felt on the verge of a mental breakdown and went to a psychiatric hospital. He couldn’t get support services to help him. Eamon highlighted the need for both practical and emotional support for full time carers as well as the need to support them financially throughout their caring roles. Also attending today was family carer Johanna Powell from Wexford. Johanna cares for her daughter, Siobhán (32), who has a rare genetic condition which means she can’t walk or eat solid food and is non-verbal. Siobhán has been on a waiting list for long-term residential care since 2013. “Our home and respite services are painfully underfunded and family carers are fighting desperately for supports. 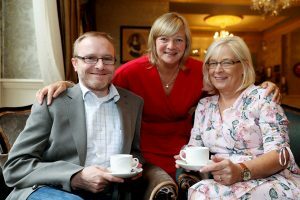 While the Government’s recent launch of a consultation on a statutory right to home care is welcome and a necessity, carers and those they care for it cannot wait any longer for adequate services. The need for investment is now in Budget 2018” said Catherine Cox.